Rui Fernandes, M.D., D.M.D., an associate professor and associate chair of oral and maxillofacial surgery at the University of Florida College of Medicine – Jacksonville, has been inducted into the Royal College of Surgeons of Edinburgh, the oldest and largest royal college in the United Kingdom and one of the world’s oldest surgical organizations, advocating for surgical advancement for more than 500 years. 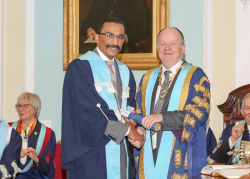 Fernandes was inducted as an ad hominem fellow in a ceremony last fall in Scotland. He is the third surgeon out of more than 10,000 in his specialty in the United States to receive the honor. Fernandes was also asked to address the college’s new fellows during the ceremony. In that speech, he shared the lessons he has learned, tips on how to achieve success as a surgeon and, most importantly, how to show compassion to patients as they go through difficult ordeals. Fernandes, a fellow of the American College of Surgeons, joined the UF College of Medicine – Jacksonville in 2005. He is chief of head and neck surgery and director of the head and neck oncologic surgery and microvascular fellowship program. He is also co-director of the UF Health Skull Base Center – Jacksonville, which treats patients with skull base tumors, brain tumors and related conditions. The center is the only one of its kind in Northeast Florida and Southeast Georgia.